HINT: Bounce the vehicle at the corners up and down to stabilize the suspension and inspect the vehicle height. (a) Remove the rack boot set clips. (b) Loosen the tie rod end lock nuts. (c) Turn the right and left rack ends by equal amounts to adjust the toe-in. 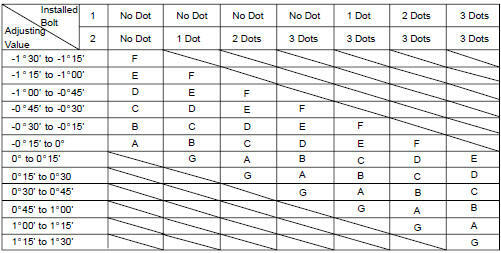 (d) Make sure that the lengths of the right and left rack ends are the same. Rack and length difference: 1.5 mm (0.059 in.) or less (e) Torque the tie rod end lock nuts. Torque: 74 N*m (755 kgf*cm, 55 ft*lbf) (f) Place the boots on the seats and install the clips. 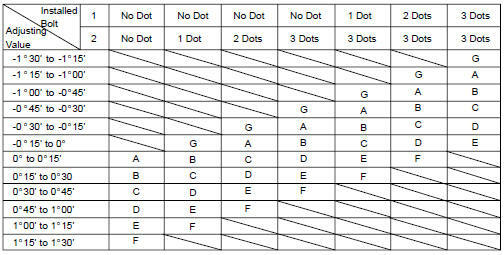 (g) Perform VSC system calibration (see page 05-765 ). (a) Turn the steering wheel fully left and right to measure the turning angle. If the right and left inside wheel angles differ from the specified value, check and adjust the right and left rack end lengths. (a) Put the front wheel on the center of the alignment tester. (b) Set the camber - caster - kingpin gauge at the center of the axle hub or drive shaft. If the caster and steering axis inclination are not within the specified values after the camber has been correctly adjusted, recheck the suspension parts for damage and/or wear. NOTICE: Inspect toe-in after the camber has been adjusted. (b) Remove the 2 nuts on the lower side of the shock absorber. HINT: When removing the nuts, keep the bolts from rotating. (c) Clean the installation surface of the shock absorber and the steering knuckle. (d) Temporarily install the 2 nuts. 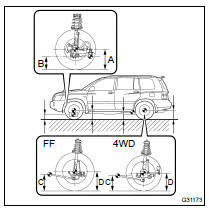 (e) Fully push or pull the front axle hub in the direction of the required adjustment. Torque: 230 NVm (2,350 kgfVcm, 170 ftVlbf) HINT: When installing the nuts, keep the bolts from rotating and then torque the nuts. NOTICE: Keep the bolts from rotating and torque the nuts. (h) Install the front wheel. Torque: 103 NVm (1,050 kgfVcm, 76 ftVlbf) (i) Check the camber. Check installed bolts combination. Select appropriate bolts from the table below to adjust the camber to within the specified range. NOTICE: Replace the nut with a new one when replacing the bolt. (j) Repeat the steps mentioned above. At step (b), replace 1 or 2 selected bolts. HINT: Replace one bolt at a time when replacing 2 bolts. (k) Repeat the steps mentioned above. At step (b), replace 1 or 2 selected bolts.